DJ Tiesto aka Tijs Verwest has been and still is one of the forerunners of the global trance industry. Since his days producing under guises such a Stray Dog, and West & Storm, to his more recent outings under his own name, he has been a huge hit at every corner of the world. His work with Benno de Goeij, Ferry Corsten and Armin van Buuren have been of the highest quality. But this year he has decided to spend more time on his own productions and DJing and has left the "Gouryella" act which, with fellow dutchman Ferry Corsten have produced some of the most legendary trancers already. But Ferry has still continued the Gouryella journey with the upcoming "Ligaya" release. Aside from Productions, Tiesto has worked on numerous remixes, including that of Jan Johnston, Goldenscan, Surreal and Yahel. All of which have been highly sought after and of excellent standards. More recently he remixed Moby, and Dave Matthews Band which have been released in 2002. 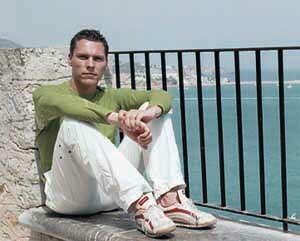 Tiesto also has an extensive line of CD compilations from his Black Hole label, including the acclaimed "In Search of Sunrise" series which every who has heard, loves. Magik has been the one which he has put out over the past few years and there is currently talk of another Magik compilation coming out towards the end of this year. We shall see. Tijs was also part of the foundation of Black Hole recordings, which is one of the biggest trance labels at the moment, with some of the finest releases over the past few years on the label, as well as their sub labels. More to come in 2002 I'm sure! Having just released his "In My Memory" album and a remix LP of the title track, he has not faltered, and from his 2001 hits of Flight 643 and Urban Train he has covered most of the trance genres around.